The employment management, merchandising, customer service and many other responsibilities are assigned to retail managers. There are almost 35% people who get the point of creating attractive headlines. 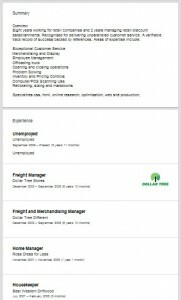 For example, you can make a title ‘Experienced Professional Hunting for Retail Manager Position’. Try to create this kind of subheadings. Secondly, the personal photo should be used but you must look professional in it. Your profile picture and headline are two of the most important and most viewed elements of your profile. Instead of ‘Unemployed at Unemployed’, use your headline to give a quick summary of your background and the type of position you are seeking. One example of this could include ‘Experienced Retail Manager Seeking Position’. Your experience section should expand on the information listed in your summary. Consider adding more of details about your experience, such as your duties and accomplishments, to this section. LinkedIn allows space for up to 50 skills to be listed in your skills section. Your current profile does not have any skills listed. Having skills related to your previous positions and the position you are seeking will give your profile visitors a better understanding of your abilities. The retail managers are responsible for performing multiple duties at once. Try to add all the major skills in your profile. The summary section is given to writing everything about your professional life in a brief manner. You need to utilize this space properly. Whether you are an employed professional or jobless individual, make sure that certain differences between profiles of both types of people. Adding minimum three skills is important to impress the employers. However, the average number of skills in LinkedIn profiles are 20 to 25. The personal photo isn’t a thing to miss in your LinkedIn profile. Keep this thing in mind. If you don’t have a good command of English language, then try to take assistance from experts to write correct text in the profile. 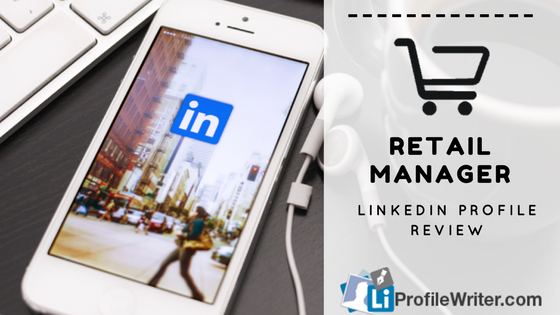 Take screenshots of some successful LinkedIn profiles of retail managers and read them out to get proper assistance. Never forget to write about a current position that you left or still working on it. The welcoming and warm attitude towards employers show the good gesture and kind attitude. Keep your tone in such a manner. The buzzwords can create a problem and develop a negative image of the candidates. The overused buzzwords like driven, organizational, expert, strategic, analytical are generally used by the people. 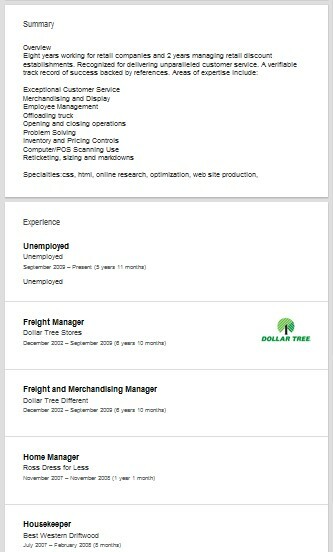 The retail management job is specified for many duties including markdown, sizing, computer scanning, pricing controls, problem-solving, closing operations, offloading truck, merchandising and many other tasks etc. When you begin creating a LinkedIn profile, make sure that you discuss all of these duties. The space of summary is ideal to discuss old experiences of working in different organizations. Add the former and recent co-workers, family, friends, and acquaintances to increase your connections. Do you bother yourself to assess the connections or contacts you’ve added to personal LinkedIn profile? Well, this is important at least once a week. It should be done before focusing on any other step. Give an hour to check who are worth to add and delete from your profile. Also, check what you’re up to? Adding people and making connection isn’t enough indeed. Show your skills, potential and abilities by remaining active through many ways i.e. posting a video on YouTube (share the link on profile), making personal blog and make followers etc.